Happy birthday John Wallner (Hail Stones and Halibut Bones). It’s the birth date of Walt Morey (1907–1992), Gentle Ben, Joan Lowery Nixon (1927–2003), Nightmare, and painter Norman Rockwell (1894–1978). Read Norman Rockwell: Storyteller With a Brush by Beverly Gherman. In 1690, the Massachusetts colony issues first paper money in America. Read A Smart Girl’s Guide to Money: How To Make It, Save It, and Spend It by Nancy Holyoke, illustrated by Ali Douglass. Boy Scout Anniversary Week begins today. Read The Official Handbook for Boys: The First Boy Scout Handbook, originally published in 1911. The sixteen-day celebration of Chinese New Year, marking the year of the Wood Horse, began on January 31. If you want to prepare for this event there is a perfect book to read, published only a few years ago. What does it mean to be a Chinese-American, particularly if most traces of your native culture have vanished from your life? When writer Grace Lin traveled to Hong Kong, Taiwan, and China to answer this question, she immersed herself in the legends and folktales of the country. Just as other authors before her (Jean Fritz or Allen Say) hunted for their roots by creating children’s books, Grace took her own personal journey and wrote one of the best books of the twenty-first century, Where the Mountain Meets the Moon. Of all the books I have read in the last few years, Where the Mountain Meets the Moon stands as good a chance of becoming a classic as any book in this time period. A Newbery Honor book that adults and children adore, the story works for independent reading or for reading aloud in both families and second through sixth grade classrooms. It is a particularly good choice for sharing because the short chapters, filled with action and lyrical language, can be enjoyed just one or a few at a time. Wherever you end the narrative, young readers want it picked up again. In a land conjured up from Chinese folklore, a young girl Minli lives in poverty with her parents in the dull, brown village where Fruitless Mountain and the Jade River meet. Although poor in possessions, her father is rich in imagination, telling her wonderful stories of folklore and adventure. In a plot that perfectly follows the pattern of the hero quest as outlined by Joseph Campbell, Minli sets off to find the Old Man in the Moon and ask him for good fortune for her family. Her journey brings her the friendship of a dragon, a visit with the King, the help of a family that has learned the formula for perfect happiness, and, finally, a chance to make one request of the Old Man. In the end, all of the stories intersect to provide a completely satisfying and touching conclusion. For this polished and well-crafted text, the publisher has gone the extra mile in terms of book design. Beautiful, thick ivory paper, full-color artwork, and elegant typography add to the enjoyment of reading the book. Not only does the book seem timeless in both story and content, it looks like the kind of book that can be kept on a bookshelf, proudly, for a long, long time. Where the Mountain Meets the Moon reminds us that our best books for children can borrow from tradition and mine literature already in existence, if they do so in an original way. For children, after all, books always seem “new.” Thank you Grace Lin for this absolutely spectacular story, one worth reading and rereading every new year. Once when there were no rivers on the earth, the Jade Dragon was in charge of clouds. She decided when and where the clouds would rain upon the land and when they would stop. She was very proud of her power and of the reverence the people of earth paid her. Jade Dragon had four dragon children, Pearl, Yellow, Long, and Black. They were large and strong and good and kind. They helped Jade Dragon with her work, and whenever they flew in the sky she was overwhelmed with love and pride. Originally posted February 3, 2011. Updated for . I love a lot of books but I LOVE this Where the Mountain Meets the Moon. I always recommend it to fans of The Wizard of Oz. My younger son and I loved this book. We read it as a read-aloud, but he’d read ahead every day so I had to sneak the book to get the parts I missed. This really does feel like a classic. I agree that the writing and the book itself are both beautiful. Every time I see, read, or hear about this book, I want to read it more. Another one for the list! I’m so glad that you connected it to Chinese New Year… now I can remember to call the Chinese members of my family and wish them a happy holiday! The second grade class I was doing observations in for my MAT was having this read aloud to them and they were so into it! They had so many questions and predictions and would do the class-wide, “Ahhhh!” when the teacher would stop reading. I’ve only caught bits and pieces but I’ll have to read it someday. I just finished this treasure and was under its spell the entire time — I don’t ever remember the last time I let out a such a loud sigh of contentment while closing the cover of a book before! We had the opportunity to interview Grace Lin for Reading Rockets last year, and she shared the moving, heartbreaking story behind the story. It’s far too personal to summarize here, but she tells it in the video clip, “A search for happiness.” It will forever change the way you see this beautiful book and its courageous, inspiring author. Thanks Lydia for the post and this link. I love everything about this book – story, design, paper – all of it! Sharon: Yes, I agree. I just like holding it in my hand — one of those totally satisfying books from the point of writing, art, story, design, production. It makes me happy about the state of children’s books. This is one of my favorite books not only for the story but for the design. Every bit of it is amazing. When I heard Grace Lin speak last summer at Simmons College, I was so happy to have her sign my copy of this book. The same hand that did those drawings and the same person who adapted traditional folktales into that story held a pen and wrote in my book! What’s better? I just loved reading this book! I have recommended this treasure often to parents, teachers and students. Thanks for such a wonderful tribute to Grace Lin and this exquisite book. 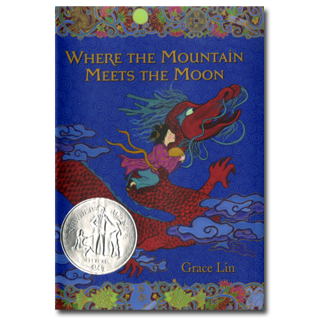 I had the pleasure of hearing Grace Lin speak at The University of Richmond this past fall and she shared with the audience that she is currently working on the sequel to Where the Mountain Meets the Moon. Yea! can’t wait! This is one of my girls’ favorite read-alouds. I think I picked it up after reading your recommendation last year and am so glad I did! A family treasure. When I read this one to my two nieces, 6 and 4, they could not stop touching the pages! The colors completely mesmerized them, and I loved that its beauty caused them to have such an unexpected tactile reaction. Such a lovely book! It also opened a door for us to talk about the Chinese New Year, and how other cultures celebrate. This is one of those books that I picked up upon someone’s glowing recommendation but haven’t yet had a chance to read it. I have no doubt that I’ll love it, and having it there to look forward to is almost part of the fun! I learn so much from your website! I always read the comments and was happy to discover the link to Reading Rockets. I enjoyed listening to Grace Lin talk about how she because an author/illustrator and now have several more books to add to my “must read” list (if only I could be around that long!). I also signed to get emails from Reading Rockets – thanks, Anita! I love this book. The storytelling is so rich, and it is so deserving of its Newbery Honor!